Description: Westbound on track two with EMD power. Description: A very short NS 21E with a BNSF SD40-2 in second at 9:38AM. Description: EB NS train lead by BNSF 613. I was almost late to work because of this one. Description: the 6824 is now BNSF 1850, spending it's days pulling and shoving cars as a yard unit. The 3503 was sold off and went to an unknown place. Description: After heading down Metropolitan Ave. because of another train blocking us up at West Cambridge Ave. we see 2 Warbonnets and a Green Bean are seen leading BNSF Train M GALKCK1 17 coming off the KCT Argentine Connection Flyover onto the BNSF into Argentine with the Kansas City Skyline in the background. This completes a run from Galesburg, IL in under 8 hours. Description: Was hpoing to catch this about a half mile east of here, but another stack train blocked our view, so we hopped in the car and flew down to catch it here where it stopped and waited its turn into Argintine yard. 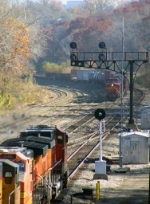 Description: BNSF 6824 about to lead a train on to Nicollet Island. Description: The LPC switches some before heading for Northtown. Description: The SD40-2 was a very rare sight on the coal empties back to Powder River basin at his date!